Okay, so while this is not of the same caliber, or as new and cool as the spectrometers, and could be considered an obsolete product, since it is no longer made – but, there are enough of these meters around in used condition, and they have been in use for so long, that finding one with the right attachments is not a serious challenge. So why bother? To start, the basic meter frame sold new for over $1,5000, with attachments to produce various readings. I found one example on ebay, sold from a test lab that was closing, that included several useful sensor heads. In new condition, this package would have cost more than $3,000, and was used on professional lab environments for years. In used condition I paid less than $250. For $350, the entire package was tested and re-calibrated to bring it up to date, which can be done for some time to come, as there are still used rebuilt units for sale now. The package delivers more options for meter reading than modern meters costing as much as this did new, so it is a decent bargain for someone so inclined to hunt for one. Each of the sensor head/adapters includes a 1/4 x 20 boss for mounting remotely on a tripod from the meter frame, using a common 15 pin cable. Another interesting accessory is the cord set that is plugged into the top of the frame for connection to a remote voltage sensing meter, as all of the outputs are, in actuality, just meter volts calibrated to represent the value of each of the heads. This came in handy once already where I was using a temperature sensor that was connected to a multi-channel voltmeter. By adding the light meter to it, I was able to record three temperatures and the illuminance of the LED source simultaneously. Pretty handy actually. While I realize this approach is not for everyone, for those setting up a small in-house lab at a manufacturer, with tight budgets, this may be just the ticket to capture a wide range of inputs from a single meter, that can be configured to suit various lab test needs. As far as accuracy is concerned, I have found the readings correlary to other meters I’ve used and have in service, so have not found any instance where concern over its age, especially now that it has been calibrated. The truly nice thing about this level of technology, is the results are what they are. With no digital interpretation going on in software, you simply attach the adapter that corresponds with the meter reading you desire, align it with the product being tested, and read the results. Not much to go wrong here. Yean, I used to use this type of light meter in labs all the time. 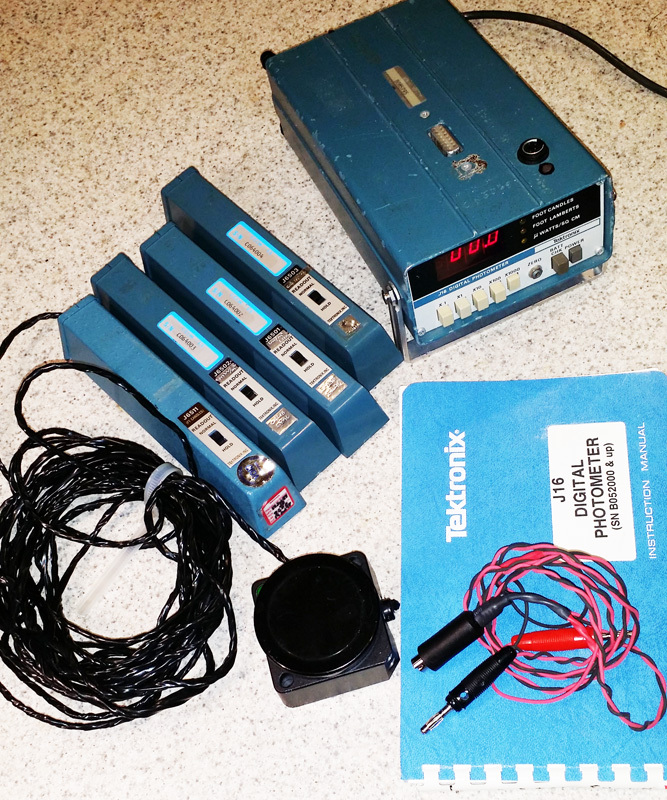 Simple and reliable, like all Tektronix.